Visiting a country is incomplete if you don’t try the street food. Street food is everyone’s favorite. In addition to the cheap price, the taste is also delicious. 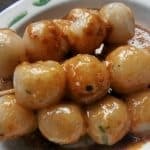 Some street foods in Indonesia even created with some different various. The sellers of street foods compete to get the most costumers by making some different creations on their foods. In Indonesian street foods, you can find both international and traditional foods. 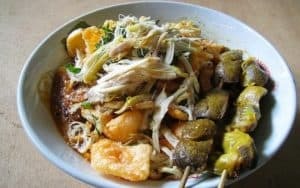 Here are the lists of common street food in Indonesia you can find. Martabak in Indonesia is known as 2 types, namely sweet and egg. This culinary is very easy to find and already has fans in every city in Indonesia. Now martabak has mushroomed in various cities in Indonesia. Sweet Martabak also has many designations even in Indonesia itself, such as moonlight cake, Bandung cake. Salted martabak or better known as martabak telur originally came from Bollywood, where Sharukhan was raised. Around the early 1930s Ahmad bin Abdul Karim (we call him Ahmad) a young man from Tegal – Central Java who met with Indian youth. named Abdullah bin Hasan al-Malibary (call Abdullah) while trading in the city of Semarang which later became friends and ended up being brother-in-law when Abdullah was invited to Ahmad’s hometown and met his soul mate, namely his brother Ahmad. Then it was named salted martabak. 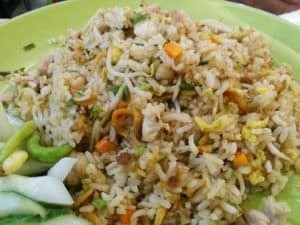 Nasi goreng or fried rice is a food in the form of rice fried and stirred in cooking oil or margarine, usually added with sweet soy sauce, onion, garlic, tamarind, pepper and other spices, such as eggs, chicken and crackers. Pecel lele in Indonesia is the name of a typical Central Javanese food consisting of catfish and halibut (spice). Usually what is meant is dried fried catfish with oil and then served with tomato sauce and vegetables. Ordinary Lalapan consists of basil, cabbage, cucumber and long beans. Pecel lele is a cheap and festive food. 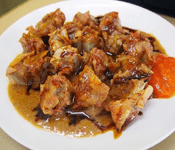 This food is very popular in Java as an alternative to chicken dishes, especially fried chicken. In some regions they have different nicknames, in Jember they are usually called catfish buckets, poorly call them lalapan lele. Fish catfish are crispy fried with a special chili with aroma of shrimp paste, vegetables like: long beans, cucumber, basil. Pecel lele stall stands in the city and on the side of the road as a sidewalk. Not only famous for its delicious taste, Soto also has a beautiful appearance. This typical Indonesian cuisine that is easily made is the most delicious when eaten during the rainy season or winter. The combination of cold air and hot sauce is the right blend. 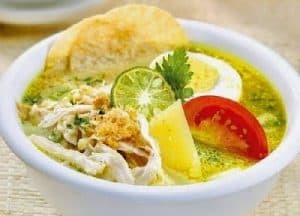 Soto ayam is found in many areas in Indonesia and Singapore. In addition to chicken the ingredients used also include boiled eggs, potato slices, celery leaves, and fried onions. Sometimes soto is also served with rice cake or white rice. In addition, chicken soup is also often served with chili sauce, crackers and koya (a mixture of crushed crackers with garlic). Ketoprak is one of the typical Indonesian foods using ketupat which is easily found. Usually ketupat is sold using a stroller on the streets or on the sidewalk. Ketroprak is authentic Indonesian food. The main components are tofu, vermicelli, cucumber, bean sprouts and can also use boiled eggs equipped with peanut sauce, sweet soy sauce, and a sprinkling of fried shallots. It can also be served with additional crackers or chips melinjo. Some versions also include tempe as a component. The tool used to process ketoprak is not difficult. You just need to press and knife. Almost every corner of the city of Yogyakarta has food stalls owned by Pasundan people. These stalls are called Burjo stalls. Uniquely, the famous one from the Burjo stall is not green bean porridge, but indomie instant noodles. 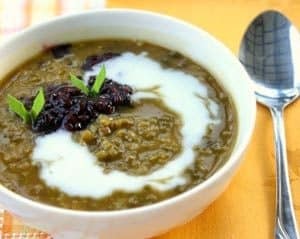 Burjo that we know so far is green bean porridge. But this is not the case with Burjo stalls in the Yogyakarta area. Burjo stalls in the Yogya area have very distinctive features. Usually the burjo stalls in Yogyakarta use striking colors, so that we (students) can easily find burjo stalls wherever we travel, which is certainly still in the city of Yogya. 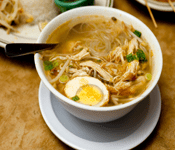 Mia ayam or Chicken noodles are people’s snacks that are increasingly being sold in villages. However, chicken noodles are healthy and nutritious snacks. 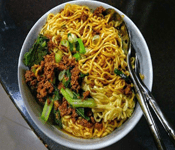 Except delicious, this food has a fairly complete nutritional content, from carbohydrates, proteins, and nutrients obtained from vegetables complementary to chicken noodles. Mie Ayam is yellow noodles or other boiled noodles can also be given chicken pieces that have been seasoned and given pieces of mustard, a little vegetable oil and sometimes there are also creative Mie ayam sellers who add dumplings, mushrooms or maybe meatballs in homemade Chicken Noodles which adds to the crowded mouth when eating Chicken Noodle which is really as fast as the mouth. Chicken Satay is a typical Indonesian food. Chicken Satay is made from chicken meat. In general, chicken satay is cooked by roasting using charcoal and served with a choice of peanut sauce or soy sauce. This satay is usually served with rice cake or lontong. Batagor and dumplings are always a good snack. Not only filling, but also cheap. batagor and siomay are usually sold together in one cart. This is because the composition of batahor and siomay is similar. The difference is, batagor is fried, while dumplings are only steamed. But both are using peanut sauce and soy sauce as a complement. Sold by using a cart, dumplings and batagor have become suitable alloys. This food from Bandung is formulated with a mixture of peanut sauce. Seblak is Indonesian food, generally is a typical meal from West Java or Pasundan that has savory and spicy flavor, which is made from wet crackers cooked with vegetables and protein sources such as eggs, chicken, marine food or processed beef, cooked with certain spices. In its development, this seblak is served with additional eggs, sausages, vegetable slices, meatballs, seafood, and others. Not only that, seblak also varied in various levels of spiciness. Seblak is made from red onion, garlic, salt, kencur, cayenne pepper, turmeric, and flavoring. After being sauteed, raw crackers that have been soaked in water overnight or hot water until chewy are then added to the stir-fry seasoning. Soto is a soupy dish with raw meat ingredients, can be given sauces, potato chips, bean sprouts and so on. Soto sauce can be coconut milk or not, the ratio of contents and sauce is one to two. Savory and fragrant soto flavor due to the use of ingredients, herbs and spices are quite varied. Soto gravy is obtained from liquid broth made from water and extractive substances of meat and spices. In making broth, the water temperature at the beginning of boiling the meat must be cold so that the extractive substances come out. Spices added to the broth can produce a deliciously flavorful broth and influence the taste of soup. In Indonesia, you can buy this food everywhere. 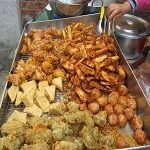 It is also a kind of street food that fits for your dinner menu. Bubur ayam or Chicken porridge is one type of porridge food from Indonesia. Rice porridge is rice cooked with plenty of water so it has a soft and runny texture. Porridge is usually served in hot or warm temperatures. In Indonesia, chicken porridge is usually sold in big cities. Usually, chicken porridge is sold by traders around. But there are also many street vendors who sell chicken porridge in one place. About the taste of chicken porridge, of course, cannot be doubted as delicious. Meatballs or meatballs are a type of meat ball that is commonly found in Indonesian cuisine. Meatballs are generally made from a mixture of ground beef and tapioca flour, but there are also meatballs made from chicken, fish, or shrimp and even buffalo meat. 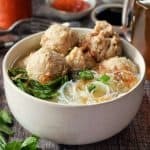 In the presentation, meatballs are generally served hot with clear beef broth, mixed with noodles, rice noodles, bean sprouts, tofu, eggs and sprinkled with fried onions and celery. Meatballs are very popular and can be found throughout Indonesia; from street vendors to large restaurants. Many types of meatballs are now being offered in the form of frozen foods sold at supermarkets or malls. Sliced meatballs can also be used as a complement to other types of food such as fried noodles, fried rice. Cilok is made from aci flour mixed with water and stirred until it becomes a flexure and clayy dough. The dough is then shaped round like a meatball. Then boiled or steamed. Ripe Cilok is stabbed like a satay then poured with peanut sauce or soy sauce. There is also a cilok that is not pierced. But if you want to be eaten, cilok is taken with a stab from wood or bamboo. In Sundanese, cilok stands from “aci dicolok”. It means this food is being stabbed. Well, from the word being stabbed is created the name cilok or aci dicolok. This is the most legend of fried food. Gorengan or fried foods has many various kinds, ranging from fried yams, bakwan, tempeh, and tofu wrapped in flour and many others. The love of Indonesian people for fried foods is of course many who take the opportunity to peddle a variety of fried menus. But surely you don’t really understand why fried foods are really really liked by Indonesians. Fried becomes very favored because you can enjoy this food anytime. Fried can be enjoyed with warm tea drinks or coffee and various other drinks. Even some of their lovers call fried food an efficient snack menu served for various events. 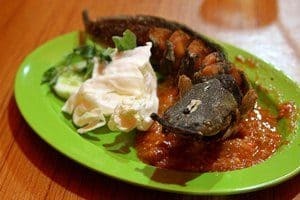 After reading those lists of street food, now you got the point that Indonesia is a country with complete combination. Not only has beautiful nature, Indonesia also has many kinds of culinary you can taste.